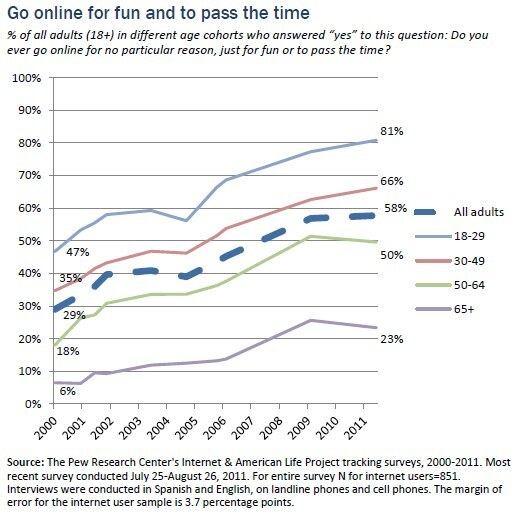 Americans are increasingly going online just for fun and to pass the time. On any given day, 53% of all the young adults ages 18-29 go online for no particular reason except to have fun or to pass the time. Many of them go online in purposeful ways, as well. But the results of a survey by the Pew Research Center’s Internet & American Life Project show that young adults’ use of the internet can at times be simply for the diversion it presents. Indeed, 81% of all young adults in this age cohort report they have used the internet for this reason at least occasionally. 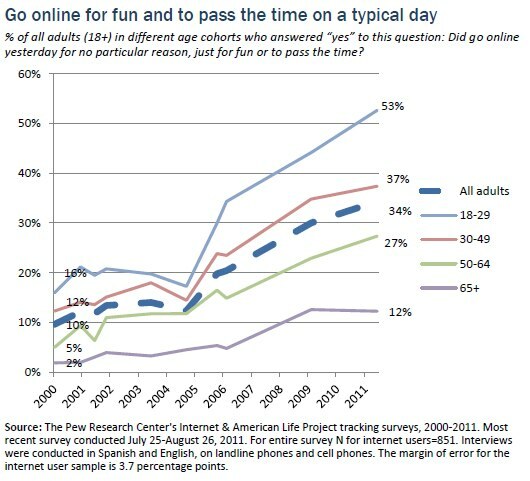 These results come in the larger context that internet users of all ages are much more likely now than in the past to say they go online for no particular reason other than to pass the time or have fun. Some 58% of all adults (or 74% of all online adults) say they use the internet this way. And a third of all adults (34%) say they used the internet that way “yesterday” – or the day before Pew Internet reached them for the survey.1 Both figures are higher than in 2009 when we last asked this question and vastly higher than in the middle of the last decade. The upsurge in the number of people who use the internet as a destination for fun and no particular purpose has coincided with a variety of trends: the rise of broadband connections, the increasing use of video that is enabled by those high-speed connections, and the explosion of social networking. All of those factors are strongly associated with people who use the internet for fun: If they have broadband, if they are online video consumers, if they use social media of any kind – especially social networking sites – they are much more likely than others to go online to pass the time. The trend also suggests the degree to which the internet has become a competitor to all kinds of other leisure activities that are pursued on other kinds of media. Still, the competition is fuzzy because most other kinds of leisure pursuits that can be digitized – from reading to game playing to “watching TV” and “listening to radio” – are now available online. Our question wording was simple and did not ask about any particular online “fun” activity, so people were allowed to answer that they were online for fun however they defined the term. The increases in the number of people going online for fun on a typical day and in the general population of those who ever go online for fun came across all age groups and other demographic cohorts. The most recent figures about those going online for fun come from a survey conducted from July 25 to August 26, 2011 among 2,260 adults ages 18 and over, including surveys in English and Spanish and on landline and cell phones. The margin of error for the sample is plus or minus 2 percentage points. In its earliest survey in March 2000, the Pew Internet Project asked about people’s use of the internet as a diversion – a place to have fun and pass the time. At the time we first posed the question, 29% of add adults (63% of the internet users at the time) said they had gone online to just idly kill some time. At that time, age and class were the biggest factors associated with using the internet this way. More young adults were online and more of them were using the internet as a diversion. And more relatively well-off and well-educated people were online and using the internet as a diversion. 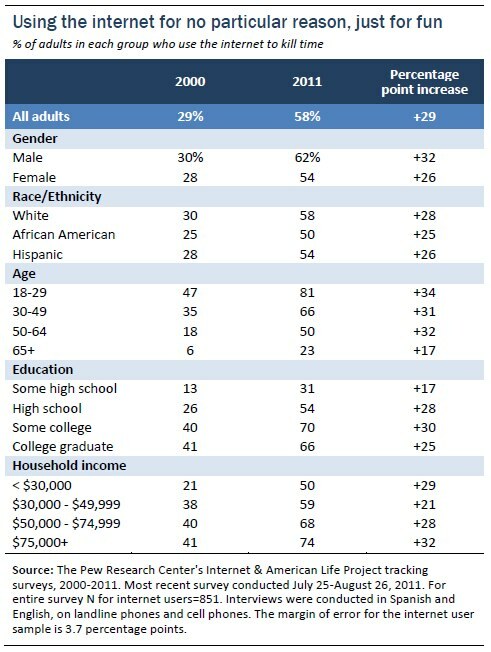 In the ensuing years, men and women, blacks, Latinos and whites, those in higher-income households and lower-income households, those with a lot of education and those without as much education, have all increased their use of the internet for this reason, as the table below shows. It is still the case, though, that well under half of senior citizens and those without high school diplomas are using the internet as a way to kill time and divert themselves.